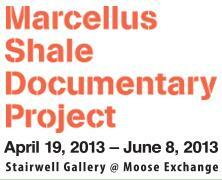 The Marcellus Shale Documentary Project: April 19, 2013 thru June 8, 2013 at the Moose Exchange, 203 West Main Street in Bloomsburg, Pennsylvania. The exhibition includes the work of six professional photographers who share in the telling of the complex story of Marcellus Shale gas drilling in Pennsylvania. This traveling exhibition opens with a reception on Friday, April 19th, at 6 p.m. and will remain on view through June 8, 2013. Artist Talks are scheduled for Wednesday, May 1st, beginning at 5 p.m. Four of the six photographers in the exhibition will discuss the project and their individual contributions to it. The Marcellus Shale Documentary Project photographers are Noah Addis, Nina Berman, Brian Cohen, Scott Goldsmith, Lynn Johnson, and Martha Rial. A series of related programs will take place throughout the duration of the exhibition. All events are free and open to the public. 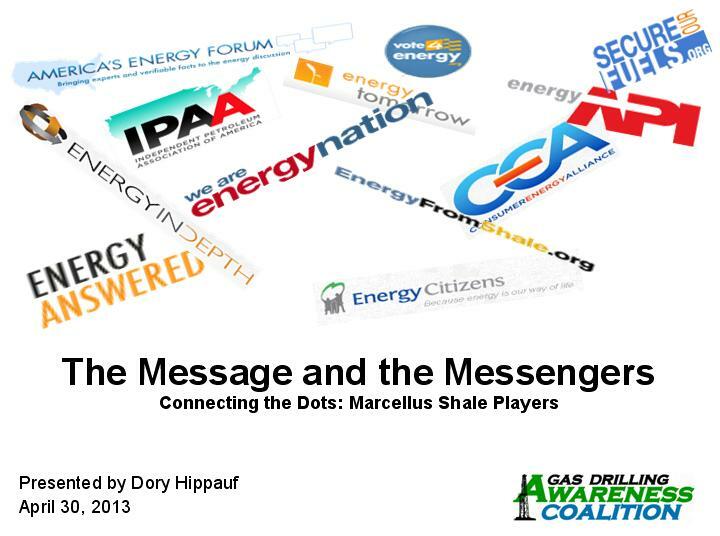 From talking points to word play to politics, Dory Hippauf connects the messaging machines and echo chambers of the Natural Gas industry. Four photographers from the Marcellus Shale Documentary Project will talk about the project and their individual contributions to it. Few issues connect environmental integrity with social and economic justice more palpably than hydraulic fracturing. Wendy Lynne Lee with show how the latest fossil fuel gambit is really the same old boy profiteering. Tags: American Petroleum Institute, API, Bloomsburg, connecting the dots, Dory Hippauf, echo chamber, eid, Energy Tomorrow, energy-in-depth, fracking, front groups, HBW Resources, Independent Petroleum Association of America, IPAA, marcellus shale, Marcellus Shale Documentary Project, Moose Exchange, natural gas, public relations, Secure our Fuels, the message and messengers | Permalink.